A poppy is one of a group of a flowering plants in the poppy family, many of which are grown in gardens for their colorful flowers. Poppy flowers have 4 to 6 petals. Petals may be almost any color, and some have markings. Before blooming, the petals are crumpled in the bud, and as blooming finishes, the petals often lie flat before falling away. A whorl of stamens is in the center of the flower. The pollen of the oriental poppy, Papaver orientale, is dark blue. The pollen of the field poppy or corn poppy (Papaver rhoeas) is dark blue to grey. Bees use poppies as a pollen source. All species of poppies are attractive and most are cultivated as ornamental plants. A few species have other uses, principally as sources of drugs and foods. The opium poppy (Papaver somniferum) is so widely used, for both drugs and food, that its worldwide production is monitored by international agencies. 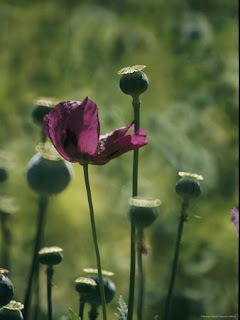 It yields opium and opiates, poppy seed for use in cooking and baking, poppyseed oil for both culinary and other uses, and is also cultivated as an ornamental plant. Poppies have long been used as a symbol of both sleep and death: sleep because of the opium extracted from them, and death because of the common blood-red color of the red poppy in particular. 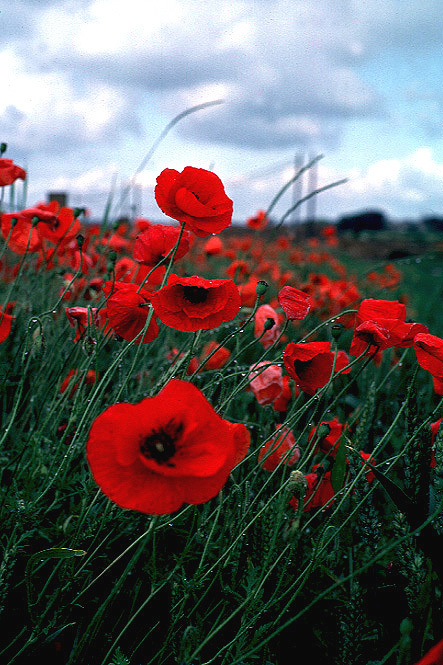 In Greek and Roman myths, poppies were used as offerings to the dead. Poppies used as emblems on tombstones symbolize eternal sleep. This symbolism was evoked in the children's novel The Wonderful Wizard of Oz, in which a magical poppy field threatened to make the protagonists to sleep forever.